I like to consider myself a pretty organized person. In my home, I like to have a place for everything and everything in its place. So I find it funny yet frustrating that I am notoriously late when it comes to sending out Birthday cards. Making sure your greetings get to their destination on time is the key it’s sentiment. Sure they make “belated” Birthday cards, but who wants to get one of those in the mail? 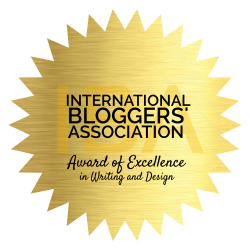 All that says is, I forgot you, sorry…here’s your card! After COMPLETELY forgetting to send the card and the gift I had all set and ready to go off to my nephew I knew I had to come up with a plan. I needed a system that not only worked but one I would be able to stick to. I tried a few hit and miss ideas but eventually found a super simple card giving system that works. Isn’t that the way it always is? Keep it simple, so it works! 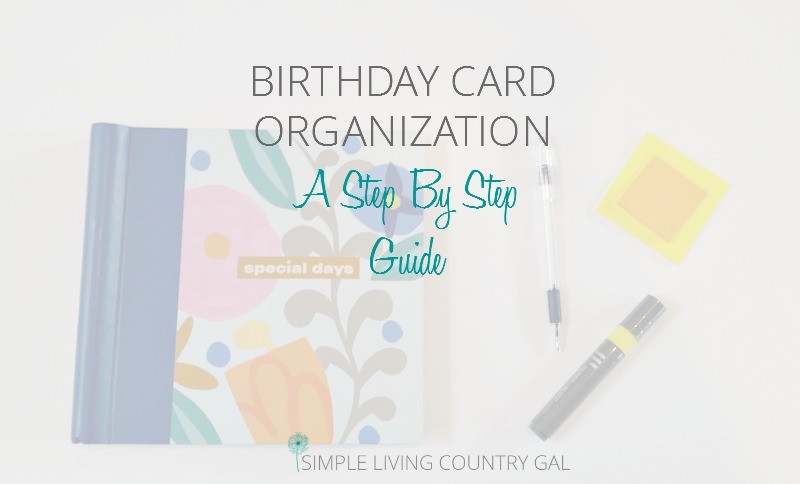 How to organize your Birthday cards and gift giving! A few years ago I came across a monthly card binder. I am sure you have seen them. It is a pretty little binder that has pockets for each month on one side and a dated chart listing each day on the other. You can write the name on the date for their Birthday (or Anniversary) and tuck a card in the pocket. It was so simple I just knew it would work. And it does, but it’s not foolproof. In order to really make this work, there needs to be more to it. So, my biggest tip for this simple system is to buy all of your greeting cards in one shot. Yep, for every single occasion make sure you have a card on hand. This really ensures you send things out on time. I purchase a card for every person in the book. I also get any cards I will need for the upcoming year. Graduations, weddings, showers, get well, and even a few extra cards for the kids in case they are invited to a party. I spend about $25-$30, but this covers the whole year. The trick is to have enough cards on hand so you do not have to run out to buy one. Try to foresee what your year holds for you and plan for it. On the way home stop at the post office and pick up some fun stamps. 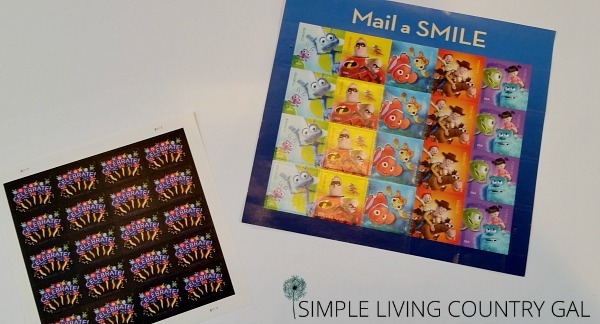 I usually get Disney and celebrate stamps along with a few love stamps for anniversaries. If you are not happy with the selection, you can always go to usps.com and purchase online. They have a huge selection and shipping is quite reasonable. Step #4 Fill your binder up. Once home put all the cards in the pockets of your binder. I write the recipient’s name in pencil in the upper right corner. Don’t worry it will get covered with a postage stamp when you mail it. This reminds me who the card is for. Another tip is to make a quick gift list for the person and write it on an index card along with their name and date. I then drop this in my calendar file so I know I will not forget it. Read: How to set up a calendar file. My productivity game changer! 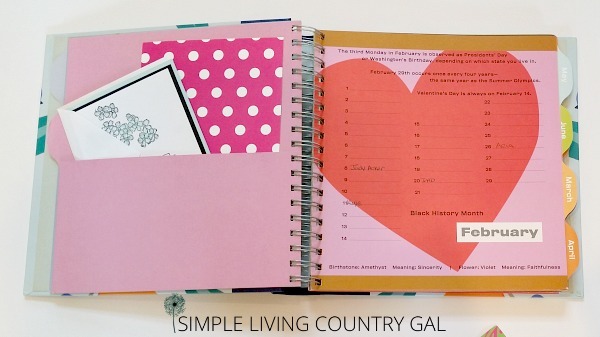 Put all Birthdays and Anniversaries on your planner and on your phone. These two tips will be your final assurance that you remember to send out your cards on time. While you are at it, why not make a phone call to wish someone blessing on their special day. Organize all your extra greeting cards in a box sorted by occasion. This way you are always prepared for any occasion that pops up. My goal is to limit my shopping as much as possible, the more I stay out of the stores, the more money I save. Step #8 Don’t forget to use it! 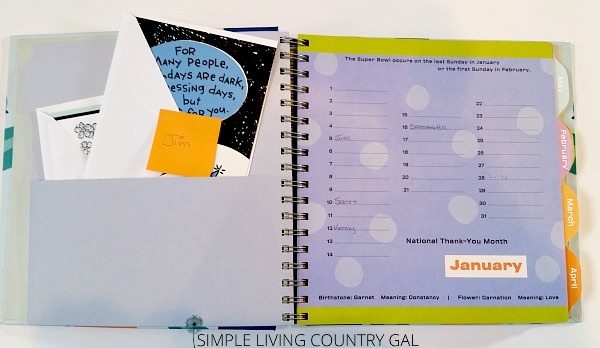 At the beginning of each month make sure to read the month in your card organizer. This will remind you of any upcoming events you need to be aware of. If a gift needs to be purchased, now is the time to get that on your shopping list. Always try to be one step ahead. I know this system is simple, but for me, those work the best. If it’s easy I know I will do it. Once upon a time I made cards all the time. Everyone would get a nice homemade card…lately I haven’t even been sending store bought cards. TERRIBLE! I’ve thought about buying a supply for the whole year, but haven’t done it. With our large and still growing family, it’s high time I do it. Thank you for your great idea!